All across Missouri, from our smallest towns to our largest cities, nonprofit arts and cultural organizations make their communities more desirable places to live and work. These nonprofits are businesses that power our state’s economy. Arts and cultural organizations create jobs and drive consumer and business spending. They generate government revenue, spur business development, and are the cornerstone of tourism. 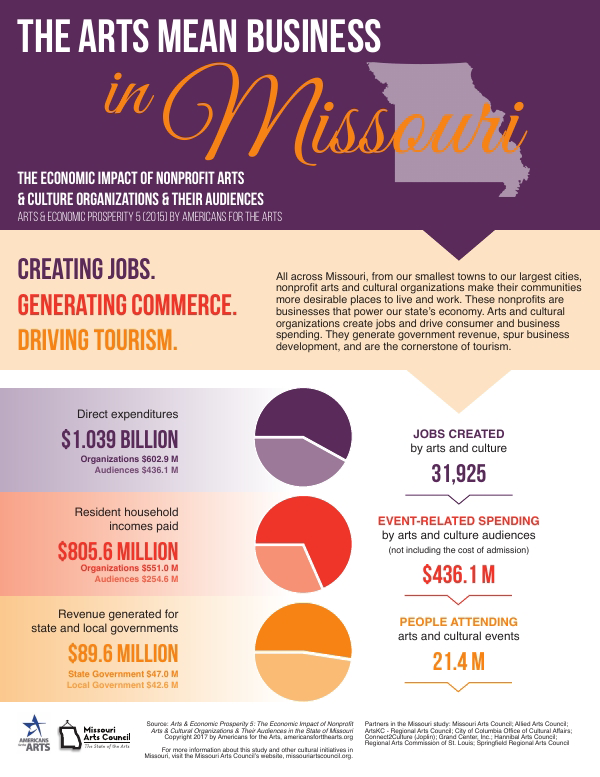 The latest compelling evidence that the arts are an investment in Missouri’s economic vitality comes from Arts & Economic Prosperity 5 (2015): the Economic Impact of Nonprofit Arts & Cultural Organizations & Their Audiences by Americans for the Arts. The Missouri Arts Council commissioned the Missouri-specific version of this nationwide study. During FY2015, the arts and culture industry in Missouri generated $1.039 billion in total statewide economic activity. The $602.9 million spent by organizations employed people locally, bought goods and services from local businesses, and attracted tourists. The $436.1 million in additional spending by audiences pumped revenue into restaurants, hotels, retail stores, parking garages, and other local businesses. 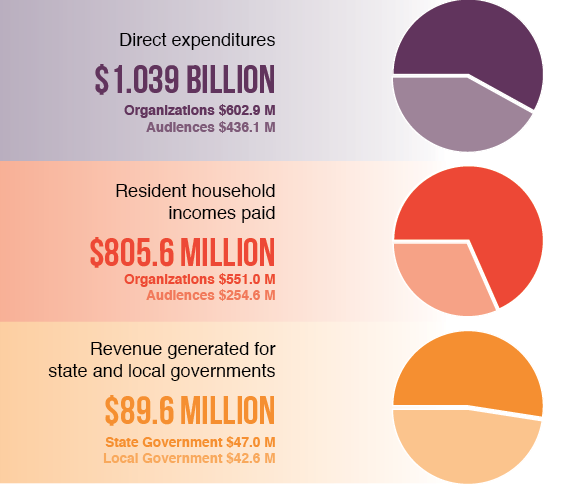 The combined spending by organizations and audiences supported 31,925 full-time equivalent jobs that created $805.6 million in household income for local residents, and delivered $89.6 million in revenue to local and state governments. Nonprofit arts and culture organizations are active contributors to their business community. They are employers, producers, and consumers. They are members of their local Chamber of Commerce and are key partners in the marketing and promotion of their cities, regions, and states. The $602.9 million directly spent by Missouri nonprofit arts and culture organizations during FY2015 reached deeply into their communities and far beyond. Organizations paid employees, purchased supplies, contracted for services, and acquired assets within their community. These actions, in turn, supported jobs, created household income, and generated revenue to the local and state governments. For instance, when a symphony paid its harpist or an art museum paid its accountant, each person’s salary, the associated government taxes, and the full-time equivalent status represented the direct economic impact. Arts and culture, unlike most other industries, also leverage a significant amount of event-related spending by audiences. For example, when patrons attend an arts event, they may park their car in garage, buy dinner at a restaurant, eat dessert after the show, and pay a babysitter. This spending generates related commerce for local businesses such as restaurants, parking garages, hotels, and retail stores. Direct economic impacts create indirect impacts as ripples of spending spread through the local economy. Consider the path of a purchase of a five-gallon bucket of paint. A theater company buys paint from the local hardware store for $100. This is the direct economic impact of the expenditure. The hardware store then uses some of the $100 to pay the salary of the sales clerk, who spends some of his salary at a grocery store, which uses some of the money to pay its cashier, who then spends some of the money to pay her rent—and so on. The hardware store also uses some of the $100 to buy services such as electricity and then to buy a new bucket of paint from the factory to restock. The utility company and the paint factory use the money to buy goods and services from other local business—and so on. The total economic impact is the combination of the direct economic impact and the indirect economic impact. Download our one-page summary as a PDF. Download our full report as a PDF. For printed copies, as many as you need, contact us at moarts@ded.mo.gov or 314-340-6852. More than 21.4 million people attended arts and culture events produced by 491 Missouri organizations in FY2015. At these events, as indicated by audience surveys, people from outside Missouri spent an average of 97% more per person than Missouri residents—$39.18 vs. $19.87. Although they were only 9.2% of total audiences, out-of-state attendees accounted for 29.9% of the total spending. When a community attracts cultural tourists, it engages significant economic rewards. Arts and culture were the key reason that 80.3% of these out-of-state visitors came to Missouri. If the arts event they attended had not been available in Missouri, 47.5% of the visitors would have gone elsewhere. Arts and culture were also strong magnets keeping residents’ spending in their own communities. If the event they were attending had not been taking place, 35.3% of local residents would have traveled to a different community to attend a similar event. When Americans for the Arts creates a new Arts & Economic Prosperity study, not only states but also regions, cities, and arts districts have the opportunity to obtain individualized studies. Nine Missouri arts organizations commissioned customized analyses for their areas. Nationwide in FY2015, the nonprofit arts industry generated $166.3 billion of total economic activity—$63.8 billion in spending by arts and cultural organizations and an additional $102.5 billion in event-related expenditures by their audiences. This activity supported 4.6 million jobs. It generated $27.5 billion in revenue to local, state, and federal governments (well beyond their collective $5 billion in arts funding allocations). The national study provides economic impact findings on 341 study regions representing all 50 states and the District of Columbia. Data were gathered from 14,439 organizations and 212,691 arts event attendees in diverse rural and urban communities ranging from 1,500 to more than four million people. Established in 1960, Americans for the Arts is the nation’s leading nonprofit organization for advancing the arts in the U.S. In 1994, Americans for the Arts began publishing sweeping nationwide studies measuring the economic impact of spending by nonprofit arts and culture organizations and their audiences. 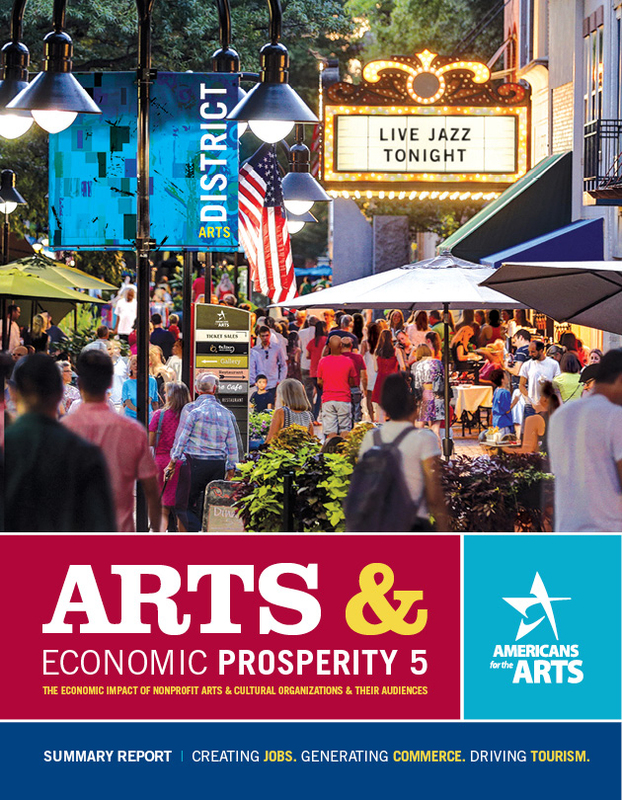 Arts & Economic Prosperity 5 is the most comprehensive study yet. 491 Missouri Organizations | Americans for the Arts collected Missouri data for Arts & Economic Prosperity 5 from 491 nonprofit arts and culture organizations. Each provided detailed budget information about more than 40 expenditure categories for fiscal year 2015 (e.g., labor, payments to local and non-local artists, operations, materials, facilities, and asset acquisition) as well as total attendance figures. 6,134 Missouri Audience Members | To measure the impact of audiences in Missouri, researchers collected data from 6,134 event attendees at a broad range of events during 2016. The methodology was an audience-intercept survey, in which patrons complete a written survey about their event-related spending while attending the event. 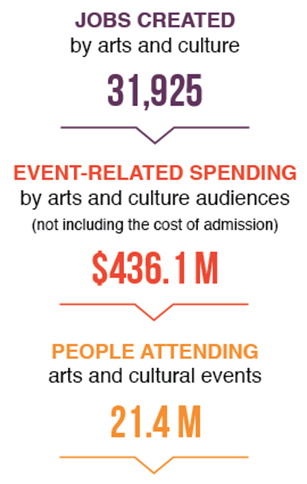 Standard statistical methods were then applied to the 21.4 million aggregate attendance reported by organizations for FY2015, yielding an estimate of arts-related spending by total attendees. The respondents were also asked to provide the ZIP code of their primary residence so researchers could distinguish between Missouri residents and non-residents. Nonprofits Only | Arts & Economic Prosperity 5 analyzes data only from nonprofit arts and culture organizations. Spending by individual artists is not included. Neither is spending by for-profit arts and entertainment organizations and venues, such as the Fox Theatre in St. Louis. Input/Output Analysis | Arts & Economic Prosperity 5 uses a highly regarded economic methology called input/output analysis to measure economic impact. It is a system of mathematical equations that combines statistical methods and economic theory. The analysis enables economists to track how many times a dollar is re-spent within the local economy and to quantify the economic impact generated by each round of spending. Full-Time Equivalent Jobs | Jobs are measured in terms of full-time equivalent (FTE), a term that describes the total amount of labor employed and takes part-time employment into account. Two half-time employees represent one FTE job. Resident Household Income | Often called personal income, this includes salaries, wages, and entrepreneurial income that residents earn. Revenue to Governments | This includes local and state taxes (income, sales, lodging, real estate, personal property, and other local option taxes) as well as funds from license fees, utility fees, filing fees, and other similar sources. Local government revenue also includes funds to governmental units such as cities, counties, townships, and special districts such as school districts. The Missouri Arts Council commissioned a Missouri-specific study for FY2008 as part of the nationwide Arts & Economic Prosperity III, which was published in 2007. 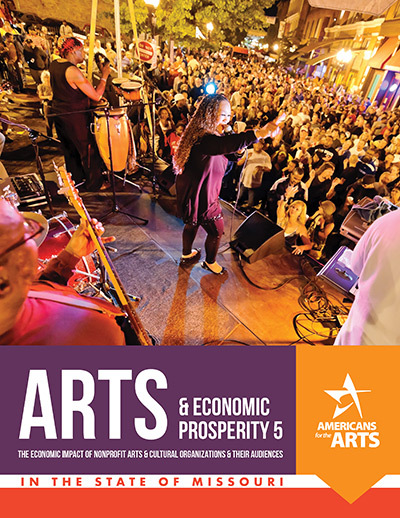 Americans for the Arts published Arts & Economic Prosperity IV in 2012. For data points from the first study, published in 1994, and the second, published in 2002, contact Americans for the Arts at research@artsusa.org.